If any of you have surfed through my website you already know I have been riding ATV's for quite sometime now. I started out on a worn-out, red Honda US-90, (ATC 90) that I bought after selling an old, English golf cart that my father bought me years before. I thought I was hot stuff back then because nobody had seen one of these weird-looking trikes before and they were amazed at some of the things I could do on it. As one gets older, and fond memories of things you did when you were a kid return, you want to keep a piece of that history for yourself to look back upon. Since that time I have been keeping an eye out for another 1971 US-90 to rebuild for a conversation piece to add to my downstairs bar area I want to build. Thanks to my brother, I was able to purchase two US-90s and have a good start on my future dust collector. Back in the early 70s Honda released the US-90 as a universal, recreation vehicle for the US market. 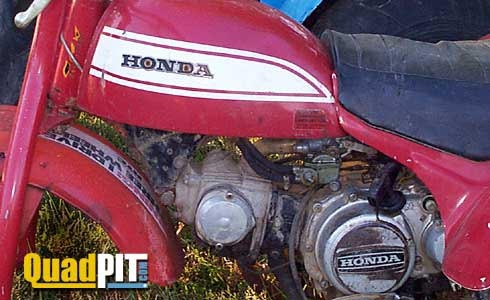 It was built around Honda's nearly indestructible, 89cc 4-stroke motor with a twin range gearbox. The motor was rated at a neck-snapping 6 horsepower and powered the one-piece, rimless tires via sealed chain drive. Back then it seems Honda really didn't know how to market their odd-looking creation. Ads featured it as a farmer's helper, and an all- purpose motorcycle that quickly disassembled to fit in your car's trunk. Even the gas-powered toy producer Testors released a hard to find version of the ATC 90 complete with air-filled, rubber tires and working pull-starter. The tires weren't really rimless although it appeared that way. Honda had the metal rims molded into the tire creating a one-piece tire and rim combination that was perfect for riding in the dunes and playing in the fields. 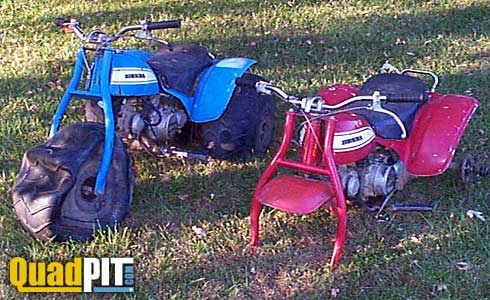 The bad thing about this design was the tires were easily punctured and had to be patched or plugged from the outside. It also made the tires an expensive replacement at $75 each considering the whole ATC cost $600 brand new in the early 70s. click here and read what motorcyclist's first impressions were of this odd-looking import from Japan. 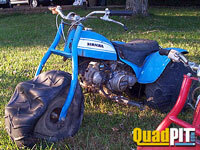 This is the ATV that started it all. Surprisingly, the seats are in very good condition for being 30 years old. This blue model has a pretty good set of fiberglass fenders too that may end up on my final project. It has all of the hardware to run but lacks the guts for the pull starter. I'm sure it will fire up without to much effort. Unfortunately, there's no saving these tires. They are seriously deteriorated and two have holes larger than my feet. Luckily, I happen to have 6 replacements that will gladly take their place. Well, it may look rough, but it runs. Although there aren't any tires this will probably be the one I try to rebuild since I am interested in a red model. 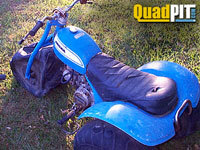 I have one other of these US-90s but it's not in as good of condition and will probably be used for a parts bike. Although you can't tell from this photo, just above the carburetor bowl, was a pullout knob that adjusted to different altitudes in case riders went above tree line and didn't feel like walking. Home | 3-Wheels | 4-Wheels | Magazines | Future Rides | Tech Tips | Crash & Burn | Links | About Me?